Last month, the Center for American Progress published an issue brief that looked at the massive climate impacts of low-cost coal mined in the Powder River Basin in Wyoming and Montana. The Powder River Basin, or PRB, which is home to the largest coal reserves in the United States, currently supplies approximately 40 percent of the nation’s coal and accounts for a full 13 percent of all U.S. greenhouse gas emissions. For decades, the U.S. Department of the Interior’s Bureau of Land Management, or BLM, which owns the overwhelming majority of the coal reserves in the PRB, has incentivized maximum production of coal in the region without regard for pollution costs or for the fair return of revenue to taxpayers. Our analysis reached the following standout conclusions that policymakers will need to address as they explore long-overdue reforms to the BLM coal program. As a result of federal policies, coal from the PRB is selling at below-market rates. At $13 per ton, PRB coal sells for around one-fifth of the price of coal produced in the Appalachian region. The carbon-pollution costs from mining and burning coal from the PRB are $62 per ton—resulting in more than $19 billion per year in losses and damages from carbon pollution. In 2012, the United States exported almost 127 million tons of coal, making it the fourth-largest coal exporter in the world behind Indonesia, Australia, and Russia. Demand for U.S. coal exports is expected to rise dramatically in the coming years, driven primarily by industrialization in India and China. At the same time, domestic coal use is likely to fall due to lower demand in light of the Obama administration’s new power-plant rule, which will cut carbon pollution from existing power plants by 30 percent by 2030. Taken together, the PRB’s below-market prices, sky-high pollution costs, and rising exports represent a powerful threat to U.S. climate goals. Put plainly: Massive exports of federal coal undermine the carbon-pollution reductions the Obama administration is achieving at home through improved vehicle efficiency and curbed emissions from U.S. power plants, while subsidizing other countries to burn coal owned by American taxpayers. Despite the risks and drawbacks, however, the export of federal coal has received relatively little scrutiny or discussion in the context of U.S. climate policy. For this reason, we asked CAP’s economists five questions to help provide a deeper understanding of the economics of coal exports and explain why policymakers should be concerned. 1. How much coal from the Powder River Basin is currently being exported? Thus far, modest amounts are being exported. In 2012, all coal exports from the primary PRB coal-producing states of Wyoming and Montana equaled approximately 3.128 million tons and 9.085 million tons, respectively. This accounts for approximately 10 percent of the almost 127 million tons of coal exported out of American ports in 2012 and just 3 percent of the total 419 million tons of coal produced from the PRB in 2012. 2. With federal coal from the PRB selling at $13 per ton domestically, why is more of it not currently being exported to China or to other Pacific Rim countries where it could sell for 10 times as much? This is going to sound trivial, but coal companies’ main barrier to increasing exports from the Powder River Basin is their lack of capacity to load the coal onto ships. That’s it. There is no significant coal-export capacity or throughput at U.S. ports on the Pacific Coast, and the capacity at existing shipping terminals in British Columbia is not sufficient to enable large-scale coal exports to Asian markets. It is also far less cost effective to transport PRB coal to existing coal-export terminals in the U.S. Southeast and mid-Atlantic—such as Baltimore, Norfolk, New Orleans, Mobile, and Houston—for export to Asian markets. Coal companies are well aware of the demand growth in Asia and are working on removing the infrastructure barrier they face on the West Coast. Reviews are underway for two new proposed coal ports in Washington state—at Longview and Cherry Point—and one in Oregon, at the Port of Morrow in Boardman. Together, the three terminals would add more than 130 million tons of additional shipping capacity per year. According to recent projections by economists Thomas M. Power and Donovan S. Power, with this new infrastructure in place, the projected delivery cost of PRB coal to China will be approximately $77.16 per ton. 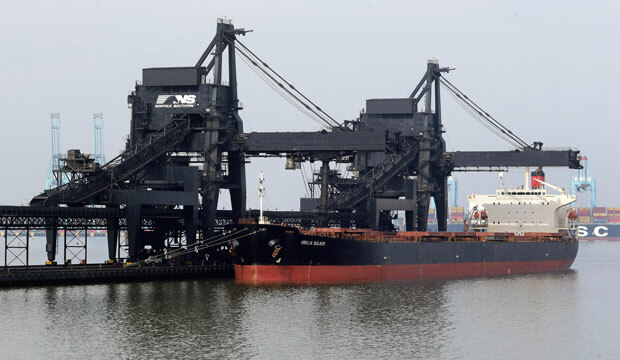 The leading benchmark delivery price in international coal shipping to the industrial southeastern region of China has fluctuated between roughly $70 and $135 per ton over the last five years, with prices declining recently as China’s economy has slowed. It is worth noting that while shipping PRB coal from the United States to southern China is more costly than shipping from Australia or other Asian ports, the mine-mouth price of PRB coal is so much lower than those of competitors that it more than makes up for the difference. 3. If the United States does not export PRB coal to China, won’t the Chinese simply buy their coal elsewhere? This is a good question, and the answer hinges on how price sensitive China’s medium- to long-term coal consumption turns out to be. It is true that PRB coal will compete with and displace other coal sources shipped by sea to the southeastern coast of China, but it will also compete with other fuels. Regardless of what other fuels PRB coal competes with, however, its projected delivery price is so low that expanded shipments would certainly have broader impacts on the Chinese energy market. In simple terms, PRB coal exports will exert downward pressure on Chinese-market coal prices. These low prices in turn make the consumption of coal-fired energy cheaper. Given that the Chinese economy is still growing, this is likely to yield a further boost in Chinese coal consumption. The question is, by how much? A recent empirical study of the Chinese coal market from 1980 to 2006 suggests the price elasticity of demand for coal in China is -1.2 and the price elasticity of supply is 0.5. In other words, for every 1 percent decrease in the price of coal, Chinese demand increases by 1.2 percent while supply to the Chinese market decreases by 0.5 percent. If these estimates from the International Journal of Global Energy Issues still hold, approximately 70 percent of the 130 million tons of PRB coal that is projected to be exported through the Longview and Cherry Point export terminals would represent net additional coal consumption and greenhouse gas emissions, while only 30 percent would displace other sources of coal. In other words, importing more PRB coal would mean the Chinese power sector would burn more coal, not merely replace other coal sources with shipments from the U.S. market. This is not necessarily an isolated phenomenon given strong demand and relatively high recent coal prices in various other countries throughout Asia, including India and Japan. This pattern of marginal additions in global carbon emissions from the export of PRB coal is a distinct possibility across the region. 4. Won’t increased exports of PRB coal benefit U.S. businesses and help create jobs? Not necessarily. There is no question that the mining companies that operate in the PRB, including the multinationals Arch Coal and Peabody Energy, will profit handsomely from increased exports—they would basically get much higher prices for the same product. However, the U.S. job-creation benefits of increased coal exports are marginal at best. PRB coal is cheap to produce in part because of the lower labor costs associated with surface mining. Despite the fact that the PRB is the most productive coal region in the country, it accounts for less than 8 percent of total American coal-mining employment. In 2012, the PRB employed 6,983 coal miners. By contrast, in the Appalachian region—where more labor-intensive underground mining is prevalent—57,629 people are employed in coal mining. In fact, the displacement of Appalachian coal with lower-cost PRB coal has been one of the major drivers of the overall loss of U.S. coal-mining jobs since 1990. Increased exports could result in marginal job gains in the PRB, but if they further displace Appalachian coal, the net increase in employment from increased exports would be negligible to negative. 5. How much will increased PRB coal exports contribute to global warming? Because the costs of climate change are shared globally, any marginal net increase in overseas carbon pollution has the same costs to the United States as emitting the carbon pollution at home and undercuts domestic efforts to fight climate change. Significant exports of PRB coal, however, would have uniquely large climate impacts. Even with today’s limited emissions, PRB coal would be the seventh-largest emitter of CO2 among nations. Because the sales price, as opposed to the social cost, of PRB coal is so low, it will substantially lower the market-clearing price for coal in China and India. In other words, exporting PRB coal will result in a fresh source of carbon pollution at a whole new order of magnitude. Indeed, assuming 70 percent net additional consumption—as we outline above—new PRB export activity of 130 million tons to the southeastern coast of China would result in the same annual increase in carbon pollution as adding approximately 35 million new passenger cars to the road. Nathan Joo is an intern with the Economics team at the Center for American Progress. Matt Lee-Ashley is a Senior Fellow and Director of the Public Lands Project at the Center. Michael Madowitz is an Economist at the Center. *Correction, August 22, 2014: This fact sheet was updated to reflect the large fluctuation in coal delivery prices in China over the past five years resulting partly from the recent slowdown in the Chinese economy and to clarify that our numerical analysis is based on a study specific to coal delivered to southeastern China as opposed to other Asian markets, such as India. Endnotes 14 and 16 have been edited to clarify that the calculations draw from information and methodologies from the cited sources, but that the results of the calculations are attributable solely to the authors of this report.